“These days, our smartphones are so much more than phones,” opens the press release, apparently hoping to convey Samsung’s profound understanding of the current smartphone situation. All this extra functionality, we’re told, has caused many UIs to become cluttered. This is not a trap Samsung is about to fall into anytime soon. One fairly sensible innovation is to force most of the stuff you might need to interact with towards the bottom of the screen, where the average thumb has a better chance of reaching it. Now that smartphone screen sizes in excess of six inches have become commonplace, superhuman feats of manual yoga are often required to interact with them, which can be trying. Somewhat less welcome is the apparent aim of presuming how much of a given app the user might want to see at a given moment. In order to do this “One UI keeps things simple, displaying only the functions and info the user needs to complete their task.” This seems pretty presumptuous and an example of a company overstepping the mark in its desperation to innovate and appear to be useful. Xdadevelopers had a good play with One UI recently and concluded little more than grudging acceptance of its inevitability, given the evolution of the smartphone form factor. Custom UIs are a delicate balance as they present one of the few ways for an Android OEM to appear to innovate, but a bad one can drive users away. Samsung seems to have struck an OK balance here, without setting the world on fire. 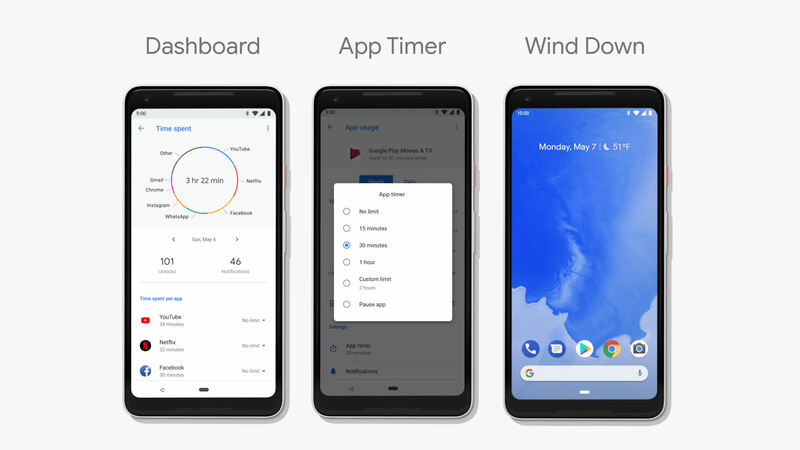 Internet giant Google has unveiled the new features that will come with the next major version of its ubiquitous mobile OS. Android P (no desert identified yet but they seem to be spoilt for choice this time with all the pies, puddings and pavlovas on offer) focuses on using artificial intelligence to augment the user interface and user experience. One of the main things it seems to address is giving users more transparency and control over how they use their phones. AI is especially handy for learning user behaviour and then using that knowledge to anticipate your every need. This can help with things like speed of loading popular apps and functions as well as optimising the performance of components such as batteries and screens. In fact a big part of the Android P announcement concerns a collaboration with Google AI subsidiary DeepMind to produce Adaptive Battery and Adaptive Brightness that are both designed to make sure you only use exactly the amount of power you need. Other new features include App Actions – an AI-drive cascade of actions anticipated from some clear catalyst, such as connecting to headphones. Slices offer a fragment of one of your apps as part of a search query to enable some actions without firing the whole thing up. A new Dashboard will offer a bunch of analytics into how you use your apps so you can see just how much of your life you’re wasting dicking about on your phone. If you’re appropriately ashamed of your temporal profligacy you can set an app timer to cut you off if you spend too much time of Facebook or whatever. One really useful feature is an enhanced Do Not Disturb that not only silences calls but all other types of visual interruptions like notifications too. The coolest part is that this feature is automatically activated when you place your phone face-down on a table and hopefully it includes the ability to keep the alarm going even when everything else is silenced. Lastly a feature called Wind Down will start shutting everything down at bed time to spare you from nocturnal tweeting. The Beta of Android P is already available on the Google Pixel phones and will soon come to Sony Xperia XZ2, Xiaomi Mi Mix 2S, Nokia 7 Plus, Oppo R15 Pro, Vivo X21, OnePlus 6, and Essential PH‑1. AI is clearly here to stay but Google needs to make sure it’s just as easy to decline all this cyber help as to embrace it, or Android P runs the risk of alienating as many people as it pleases.